Back in September 2017, Fitch (with Russia rating BBB-) estimated that the U.S. sanctions were costing Russia ‘one notch’ in terms of sovereign ratings, with ex-sanctions risk conditions for the Russian sovereign debt at BBB. 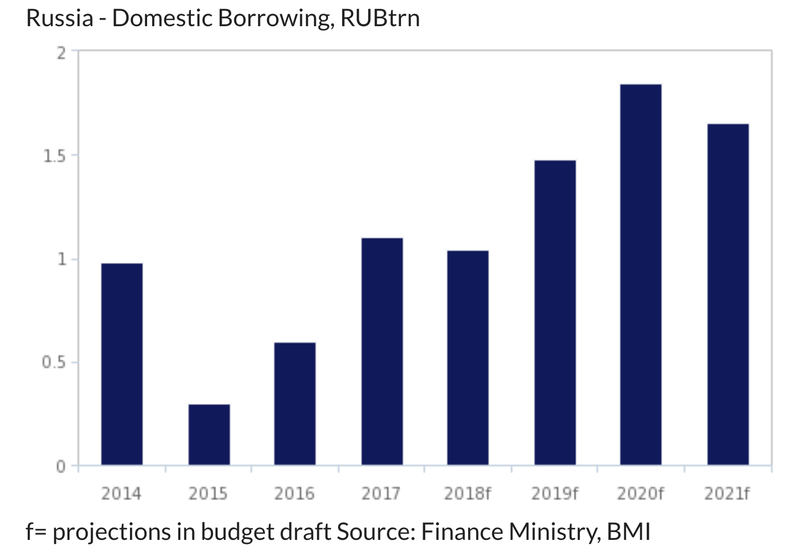 Last week, Fitch retained long term debt rating for Russia at BBB- with positive outlook, noting the Russian economy’s relative resilience to sanctions. 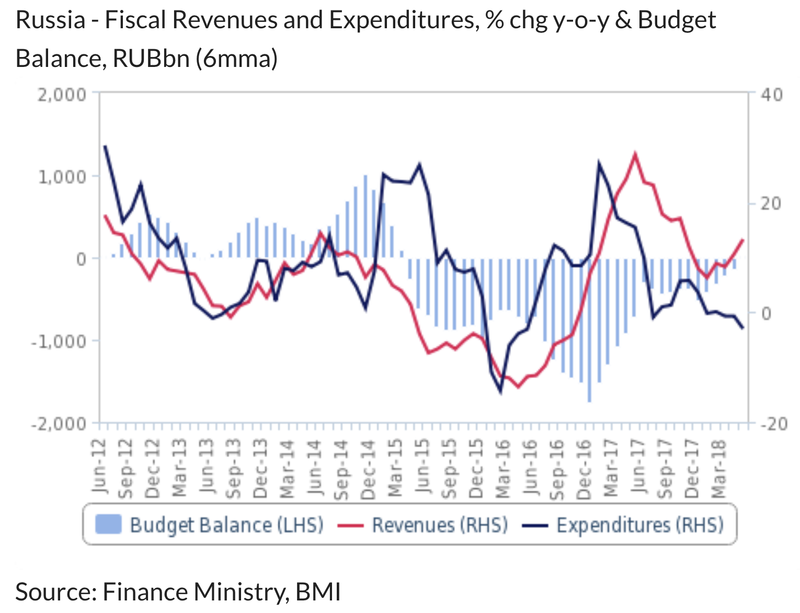 Fitch analysis projects the budget surplus to average 0.1% of GDP in 2018 and 0.3% in 2019, from deficits of 1.0% and 0.5%, respectively. 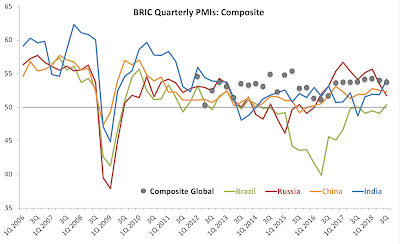 This, alongside Russia’s strong performance in monetary policy have been noted by Fitch as core markers of the Russian economy’s resilience to external shocks, including the sanctions acceleration announced back in April 2018. Increase the Value-added Tax (VAT) rate from 18.0% to 20.0% starting in 2019, which will provide (based on Moscow estimates) ca RUB 600bn (USD 9.5bn) per annum. Social and aggregate demand impacts of VAT increases were mitigated by keeping 10% rate on certain foods, children’s goods, printed publications and pharmaceuticals, or roughly 25% of all goods and services. Some transport services will continue benefiting from 0% VAT rate. The combined tax rate on wages for mandatory social contributions will remain at 22%. The tax on the physical capital of companies (capped at 2%), will no longer apply to moveable assets (the tax will remain for fixed capital, e.g. for buildings). Russia will also establish special administrative zones on Russky Island next to Vladivostok and on Oktyabrsky Island, which is part of the Kaliningrad enclave. Both will act as offshore centres where foreign-registered firms owned by Russian nationals can “redomicile” their assets. Tax advantages granted in these zones will cover taxes on profits, dividend income and different types of property. 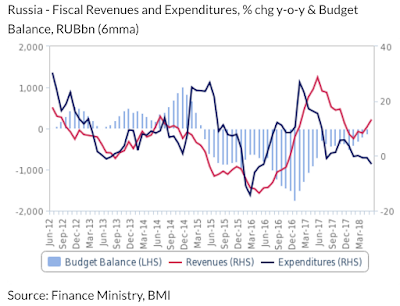 Net outrun is that even faced with escalating sanctions, and having unveiled a rather sizeable macro stimulus program, Moscow's finances remain brutally healthy. 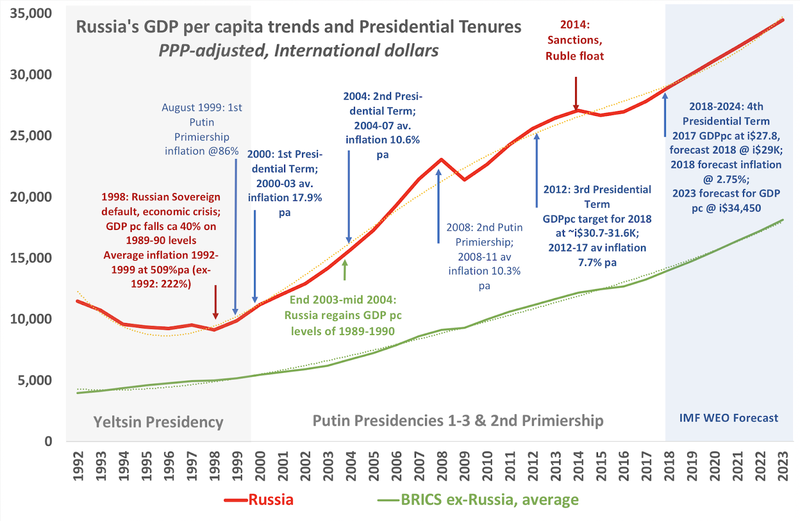 Fitch research foresees “a contained uptick in government debt levels over the coming years, with the debt burden rising from 17.4% of GDP in 2017 (IMF statistics) to about 18.3% GDP by 2020.” As share of Russian debt held by external funders continues to decline, these forecasts imply increased sustainability of overall debt levels. In it’s recent assessment of the potential impact of the ‘Super-sanctions’ (The Defending American Security from Kremlin Aggression Act of 2018 (DASKAA)) planned by Washington, the worst case scenario of all U.S.-affiliated investors dumping Russian bonds implies 8-10% decline in foreign holdings of Russian Sovereign debt, which will likely raise yields on long-dated Russian Ruble-denominated debt by 0.5-0.8 percentage points. 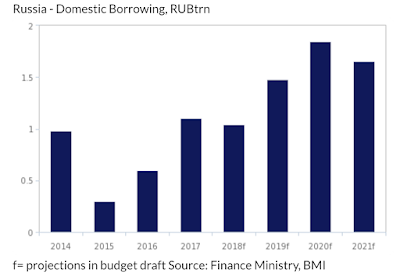 Based on August 6 analysis from Oxford Economics, Russia will have no trouble replacing exiting Western debt holders with Ruble-denominated debt issuance. Russian GDP growth rose from 1.3% y/y in the 1Q 2018 to 1.8% in the 2Q, with 1H growth reading 1.6% y/y. 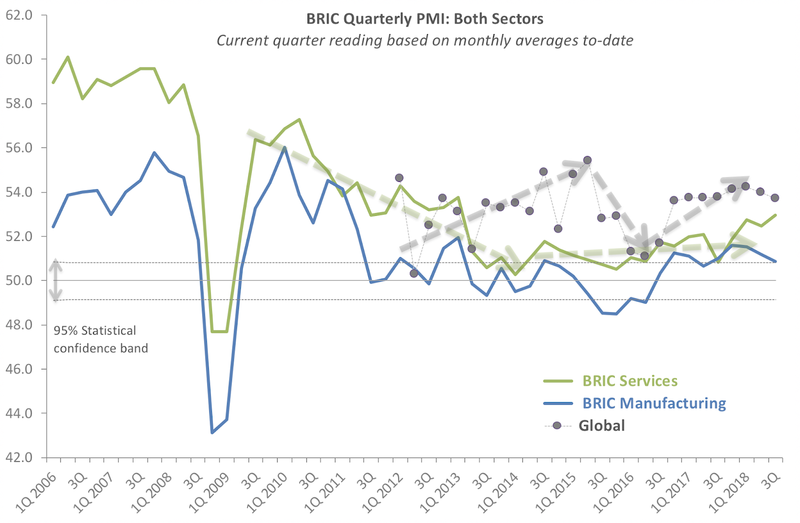 The uptick was led by faster industrial output growth (rising almost 4% y/y in 2Q) and manufacturing (up 4.6% y/y in 2Q). These are preliminary estimates, subject to revisions and, based on the recent past revisions, it is quite likely that we will see higher growth rates in final reading. 1H 2018 fixed investment rose 3% y/y. Real wages rose 8% y/y in real terms, but household disposable real income was up only 2% at the end of 2Q 2018 due to slower growth in the 'grey economy' and in non-wage income. Despite the rising household credit uptake (up 19% y/y at the end of 2Q 2018), retail sales were up only 2.5%, broadly in-line with real income growth. All of these trends are consistent with what we have been observing in recent years and are indicative of the structurally weaker economic conditions prevailing in the wake of the post-GFC economic recession and the energy prices shocks of 2014-2017. Per Powell, "the U.S. economy faces a number of longer-term structural challenges ... For example, real wages, particularly for medium- and low-income workers, have grown quite slowly in recent decades. Economic mobility in the United States has declined and is now lower than in most other advanced economies.2 Addressing the federal budget deficit, which has long been on an unsustainable path, becomes increasingly important as a larger share of the population retires. Finally, it is difficult to say when or whether the economy will break out of its low-productivity mode of the past decade or more, as it must if incomes are to rise meaningfully over time." 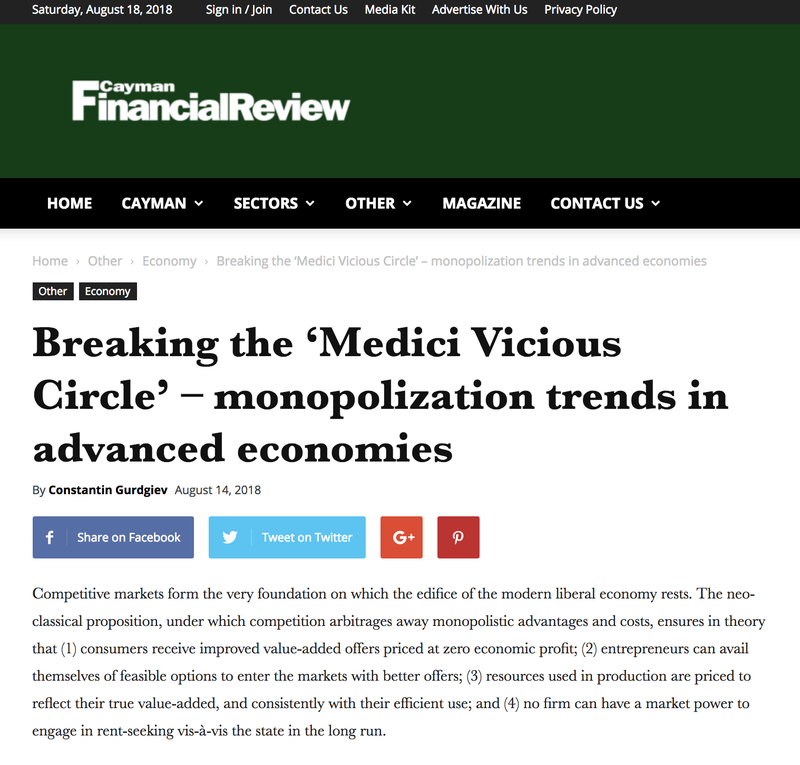 For those who might want to read about an even more fundamental (and causally linked to the Powell's challenges) structural decline in the Cayman Financial Review here: http://trueeconomics.blogspot.com/2018/08/18818-monpolization-trends-in-advanced.html. What is note worthy in Powell's passage is the words "in recent decades". Powell is correct (and I pointed this fact out on a number of occasions) that the adverse trends in the U.S. economy have been present for much longer than the post-Global Financial Crisis shocks residual effects. The economic stagnation (expressed in the abysmally low growth rates of economic prosperity for the lower 90 percent of the American population; in woefully slow expansion in productivity, compared to historical trends; in structurally less competitive nature of the economy and growing monopolization and oligopolization of the U.S. markets; in reduced physical and social mobility; in falling pensions savings provisions for the majority of the U.S. population; and so on) has pre-dated the GFC and its roots rest much deeper than the financial disruption of the 2007-2010 crisis. 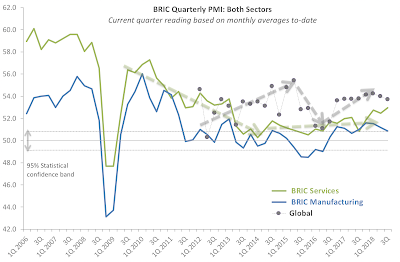 Emerging markets are at the point of risk contagion these days, with a potential spillover into advanced economies. 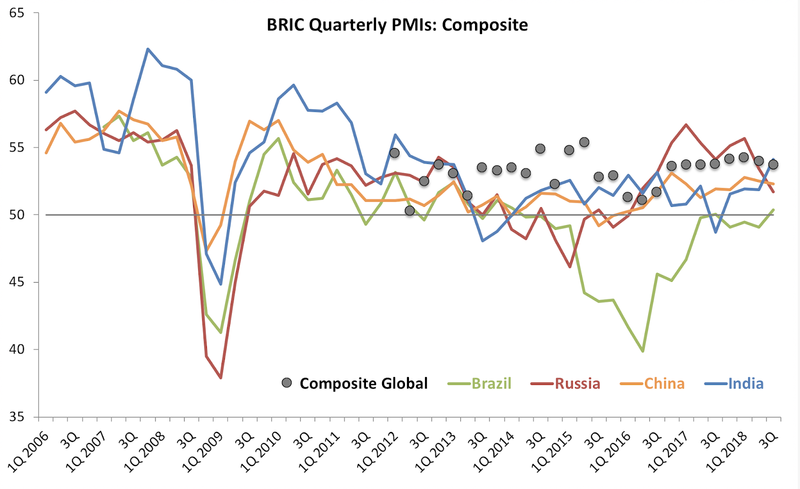 This brings us back to the memories of the past EM crises, such as the currencies crises of the late 1990s in the year (and month) that marks the 20th anniversary of Russian Sovereign Default. What the chart omits, of course, is a simple fact: of all these economies, Russia is the only one that (rightly or wrongly or both) is trading under severe financial and economic sanctions imposed by its major trading and investment partners. Which makes this performance even more impressive. 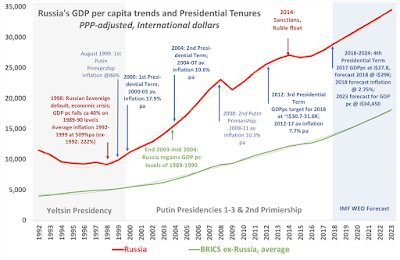 When it comes to a 'higher altitude' view of the Russian economy within historical and current geopolitical perspective, which is discussed here: http://trueeconomics.blogspot.com/2018/01/6118-spent-putins-call-means-growing.html. My column for the Cayman Financial Review on the topic of structural monopolization of the global economy and the declining competitiveness. 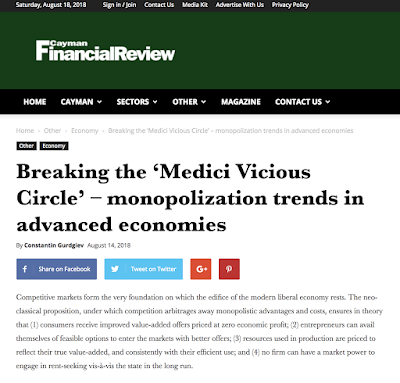 https://www.caymanfinancialreview.com/2018/08/14/breaking-the-medici-vicious-circle-monopolization-trends-in-advanced-economies/. 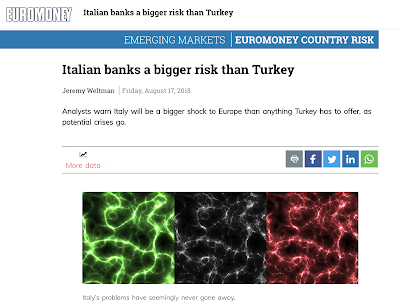 Euromoney article on the latent Italian crisis, relative to the ongoing Turkish one: https://www.euromoney.com/article/b19k3zjb7v811r/italian-banks-a-bigger-risk-than-turkey. 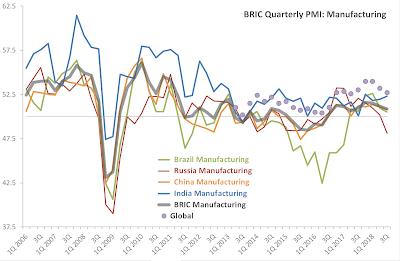 For Russia, weaknesses in Manufacturing sector, for now offset by strengths in Services, are unpleasant reminders that the economy is still fundamentally on near-zero growth path, despite early 2018 hopes for 1.9-2 percent growth projections. For China, there are growing signs of the adverse impact of Trade War with the U.S. taking their toll on growth and cost dynamics. The share of labor contribution in total economic output has, basically, collapsed. The slide started with the technological revolutions of the 1960s and 1970s, followed by computerization and supply chain management revolutions of the 1980s and 1990s. But the real collapse took place starting with 2002 post-dot.Com bust. 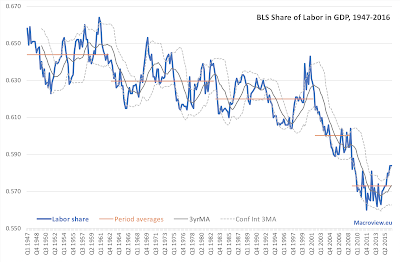 Despite the tight labor markets and very low unemployment, labor share never really recovered from this decimation. If this chart offers a stark cross-reference to socio-political environment we are living in today, such cross-referencing is not ad hoc. Labor is what we, people, have to supply in return for the life's necessities and luxuries. For the majority of us, it is ALL that we can supply. Even our assets, such as homes and pensions savings are, ultimately, tied to labor, not to capital, because their performance is linked to our peers' labor-paid demand. A middle class house is an asset to other middle class households. It is not an asset to the jet-set shopping for homes in the Hamptons. When that demand collapses, as is currently happening in a number of rapidly ageing economies, real assets we hold turn out to be if not completely worthless (https://www.businessinsider.com/italian-town-free-homes-residents-2018-1), at least severely depressed in value (https://www.soa.org/Files/.../lit-review-popl-aging-asset-values-impact-pension.pdf). So a decline in economic value added share accruing to labor is a transfer of income (and therefore wealth) from those who work for living to those who invest for living (invest in technology and/or financial assets). This game is a zero sum game even after we account for pensions funds and household investments: someone loses (labor), someone gains (investors). It is made even worse by higher taxes on labor and by transfers via monetary policy (Quantitative Easing). The only way to offset such transfers is to vest labor with claims to financial returns. In other words, by providing workers with shares in the financial markets. Simply taxing and shifting income from higher earners to lower earners won't do the trick, because some higher earners are generating their income through labor (and human capital), while others are doing so through inherited and acquired financial assets. Taxing income of the latter implies taxing incomes of the former, which, in turn, depresses returns to investment in human capital (or, ultimately, returns to investment in labor). Basic income structure of the future will have to achieve exactly that: create broad share ownership of financial instruments linked to financial and technological capital amongst those supplying labor. 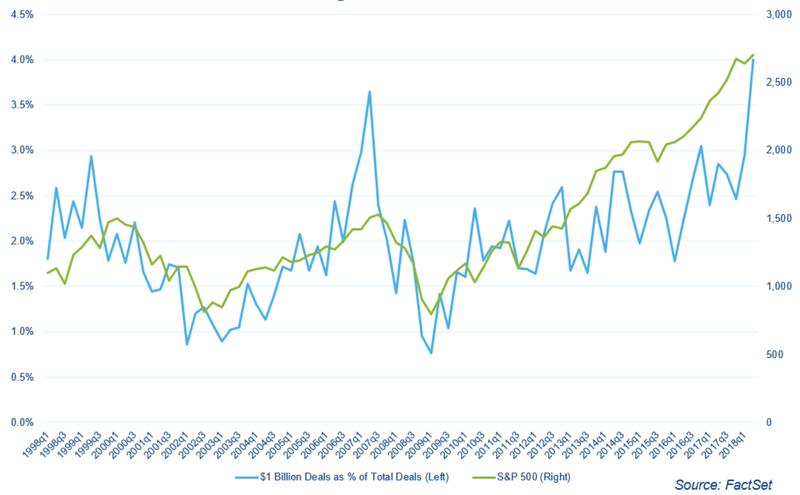 In recent media analysis of the markets, less attention that the rise in shares buybacks has been given to the M&A markets. And there are some interesting observations to be made from the most recent data on these. 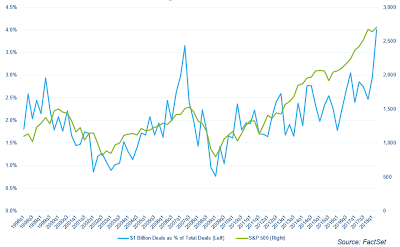 Per chart above, overall transactions in excess of $1 billion are at an all-time historical high. Per FactSet: "the first half of 2018 has reported the second-highest level of deals valued over $1 billion with 200 deals; the highest level was attained in the first half of 2007 with 210 deals. It is also worth noting that the streak of billion-dollar deals started in 2013, and since then there have been over 100 billion-dollar deals in each half-year. Even in the run-up to the financial crisis the streak was only three years (2005 to 2007). And to help complete the pattern, the dot-com boom had a similar three-year streak of 100 billion-dollar deals in each half-year from 1998 to 2000." In other words, markets reward concentration risk taking. Mega deals generally add value through increased valuation of the acquiring firm, and through synergies on costs side. 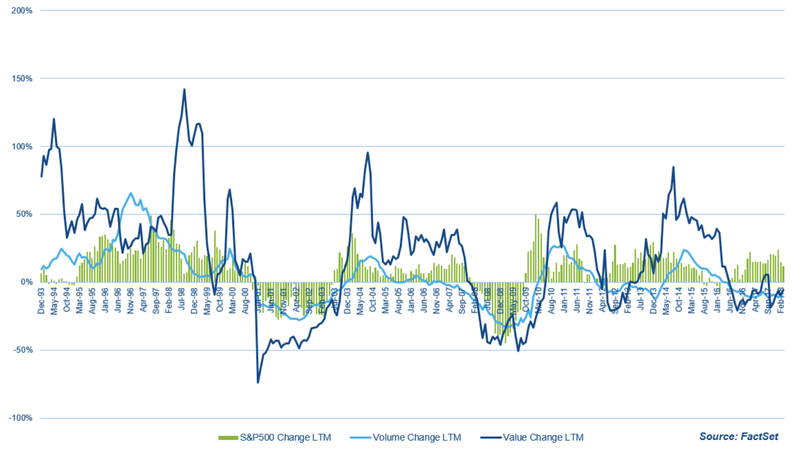 But they do not generally add value in terms of future growth capacity. Smaller deals usually add the latter value. Divergence between overall M&A activity and the mega-deals activity is consistent with the secular stagnation theses. 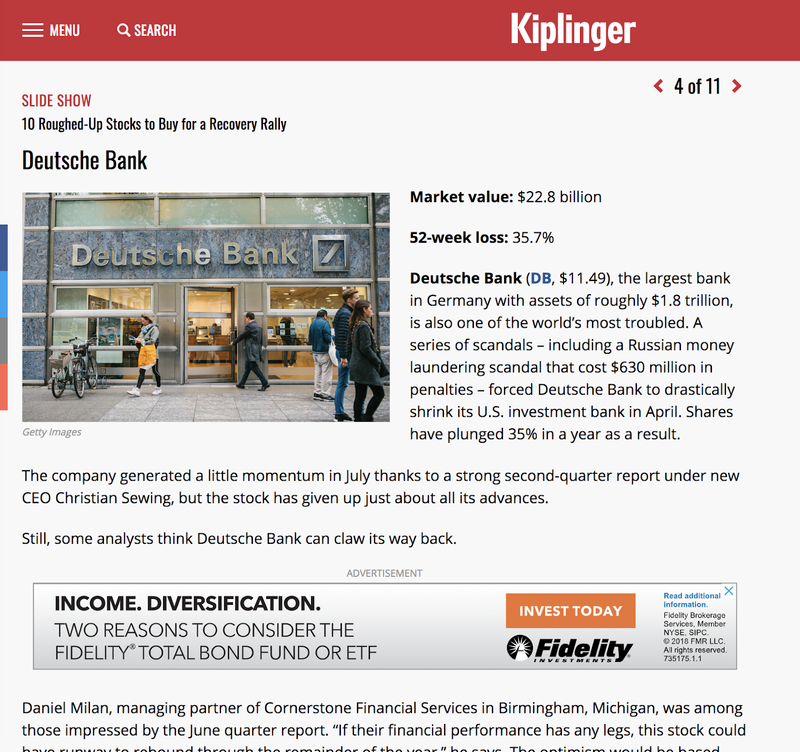 Yesterday, I have posted a quite unusual (for my normal arguments) defense of the shares buybacks. 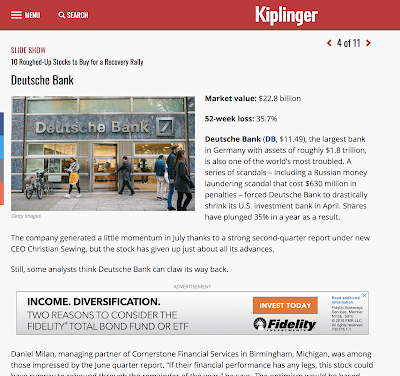 Normally, as the readers of this blog know, I see buybacks as a net negative to organic investment. However, that view needs to be anchored to the economic conditions prevailing on the ground. In other words, buybacks are net negative for investment and organic economic growth, unless buybacks are companies' rational responses to specific economic and policy conditions. Reason 1: Stock buybacks can ONLY slow down economic growth in the conditions when new investment by firms can generate higher economic value added than other uses of funds in the economy (e.g. investment by other agents, than the firm, or increasing aggregate demand by investors recycling gains from buybacks into general consumption, etc). Currently, this does not appear to be the case. 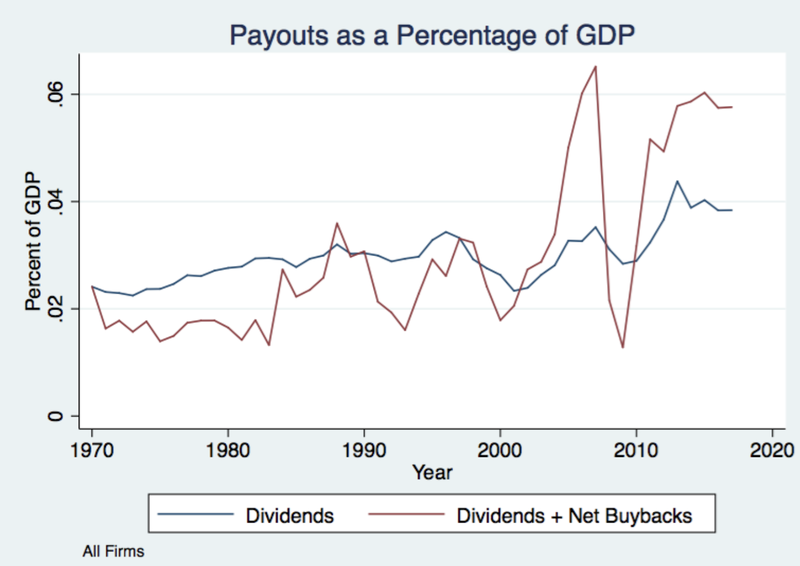 In fact, firms are hesitant to invest in the economy even when we control for buybacks. 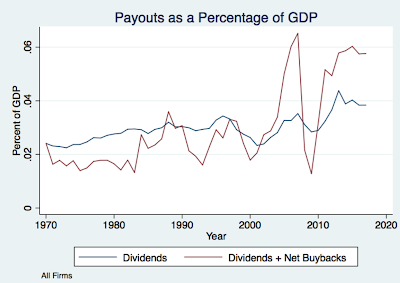 Thus, buybacks are similar to dividends: payouts of dividends and higher buybacks rates may signal lack of profitable investment opportunities for the firms. Reason 2: Stock buybacks can slow down economic growth if they increase cost of capital for the firms. With equity capital (shares) being made superficially more expensive than debt (QE, tax preferences, demographic shifts in clientele reasons, etc), this is not the case. equity capital is currently more expensive than debt as a funding source for new investment for listed companies. While this situation may reverse in time (which it did only on very rare occasions in the past), companies today can borrow cheaply to retire expensive equity. This might not make sense from the economy point of view (rising degree of financial leverage, increasing risk of destabilising increases in debt carry costs, etc), it might make sense from the company and management point of view. Reason 3: Stock buybacks can harm economic growth if they reduce returns on productivity (theory of labour productivity being unrewarded via slow wages growth). This too is not the case, because labour productivity and TFP have been collapsing since prior to the increases in shares buybacks. I wrote enough about this on this blog before in the context of the twin secular stagnations theses. 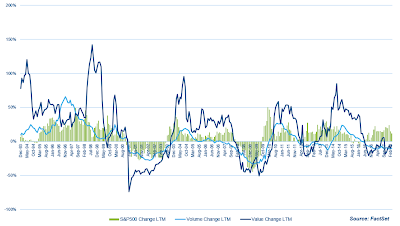 So what does the story of skyrocketing shares buybacks really tell us? The reality, consistent with Reasons 1-3 above, is that stock buybacks are a SYMPTOM of the disease, not the disease itself. Shares buybacks are driven by secular stagnation: more specifically, primarily by supply-side secular stagnation (S-SSS), and are second-order related to demand-side secular stagnation (D-SSS). How? S-SSS implies lack of profitable investment opportunities for short and medium-term investments by the firms. With falling TFP & labour productivity, and with demographically-induced slowdown in demand, this is patently so. S-SSS also implies the need for protracted QE and other distortions in capital funding costs that disincentivise equity capital relative to debt funding channels. D-SSS implies that with demographic, structural shifts in economic activity across generations, etc, aggregate demand side of the economy is getting pressured. Which means, again, 2nd order effects, adverse pressure on supply side. - Increasing concentration, monopolisation & oligopolization of the economy and the markets resulting in reduced entrepreneurial activity. Shares buybacks & resulting wealth inequality or concentration are not orthogonal sets to the political & policy mismanagement that marks the last 25 years of our (Western) history. They are DIRECT outcome of these. So, go ahead, political punks. Make the markets day. Shut down shares buybacks, so you can keep gerrymandering the economy, manipulating the markets, & bend the society to your desired ends. The longer you do this, the more you do this, the tighter is the lid on the pressure cooker. The more spectacular the blowout to follow. 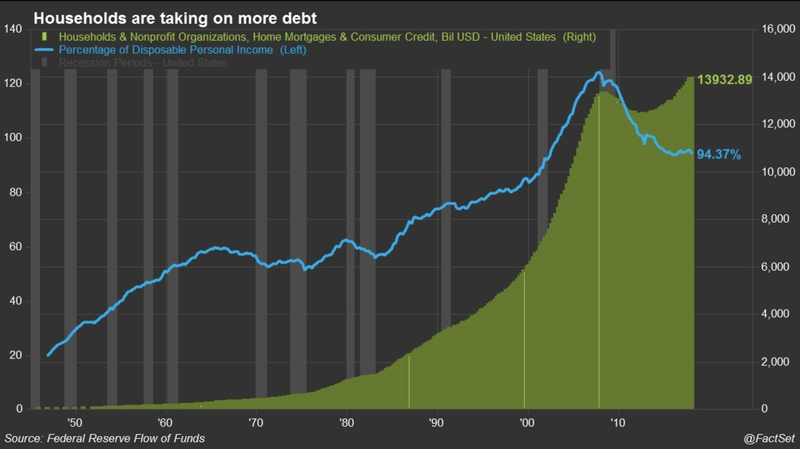 Nominal levels of household debt are up above the pre-crisis peak. Leverage levels (debt to household income ratio) is at 17 years low. 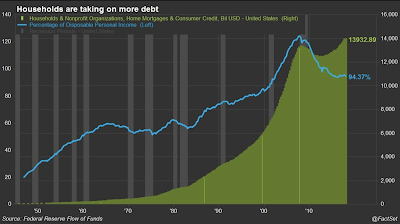 Mortgage debt is increasing, and is approaching its pre-crisis peak: mortgage debt stood at $10.1 trillion in 1Q 2018, just 5.7% below the 2008 peak. Consumer credit has been growing steadily throughout the 'recovery' period, averaging annual growth of 5.2% since 2010, bringing total consumer debt to an all-time high of nearly $14 trillion in early 2018. While leverage has stabilized at around 95%, down from the 124% at the pre-crisis peak, current leverage ratio is still well-above the 58% average for 1946-1999 period. The above conditions are set against the environment of rising cost of debt carry (end of QE and rising interest rates). In simple math terms, 1% hike in interest rates will require (using 95% leverage ratio and 25-30% upper marginal tax brackets) an uplift of 1.19-1.24% in pre-tax income for an average family to sustain existent debt carry costs. The notion that the U.S. households are financially non-vulnerable to the cyclical changes in debt costs, employment and asset markets conditions is a stretch, even though the current levels of risks in leverage ratios are not exactly screaming a massive blow-out. Just as the U.S. Government has low levels of slack in the system to deal with any forthcoming shocks, the U.S. households have little cushion on assets side and on income / savings balances to absorb any significant changes in the economy. As we say in risk management, the system is tightly coupled and highly complex. Which is a prescription for a disaster. 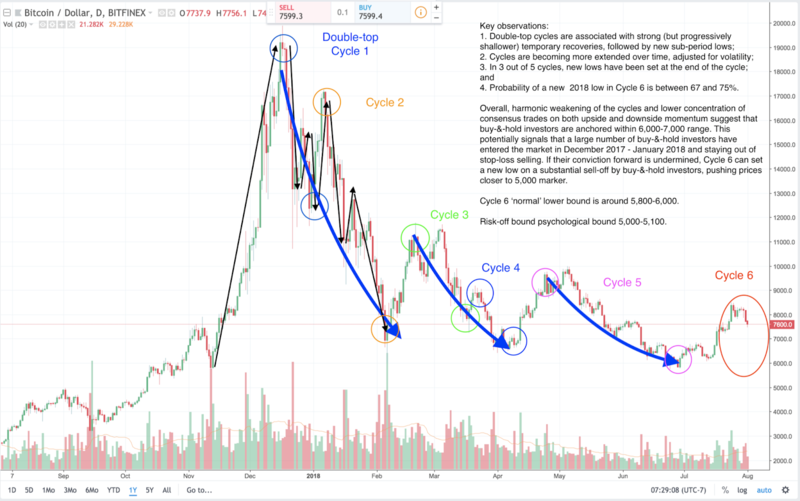 1/8/18: Dynamic patterns in BTCUSD pricing: is there a new down cycle afoot? 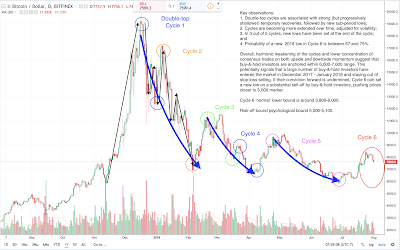 As the above suggests, BTCUSD dynamics are signalling continued structural pressures on Bitcoin prices and the start of the new double-top down cycle. The Great Unknown remains with the behaviour of the buy-and-hold investors who dominate longer-term BTC markets. Increase in market breadth with arrival of more active traders from the start of 2018 has not been kind to Bitcoin. More institutional investment flowing into the cryptos market has been, on average, a net negative for the crypto.